— NASA's next-generation rocket has a new look. The space agency has revealed a reworked color scheme for the Space Launch System heavy-lift booster, removing the paint from one major component, while adding "racing stripes" to another. The new appearance was rolled out on Thursday (Oct. 22) with the announcement that a critical design review (CDR) had been completed. 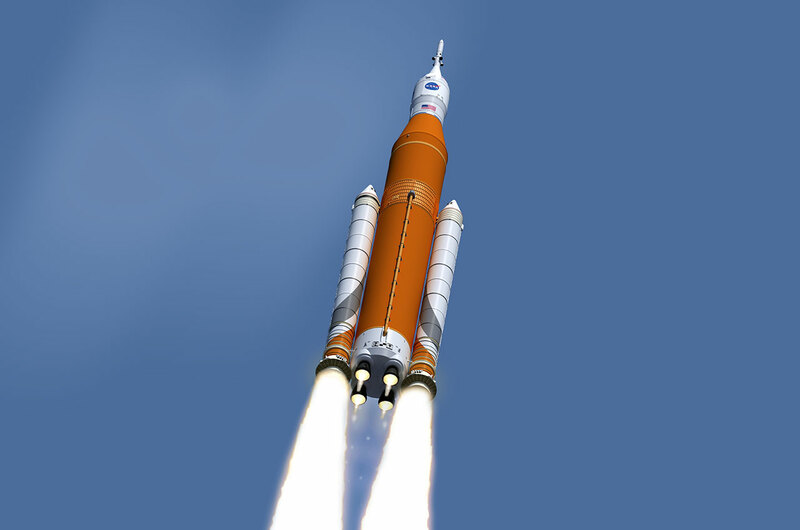 The review is a milestone toward the Space Launch System's (SLS) first test flight, targeted for 2018. "We've nailed down the design of SLS," said Bill Hill, the deputy associate administrator for NASA's development of exploration systems. "We've successfully completed the first round of testing of the rocket's engines and boosters, and all the major components for the first flight are now in production." Billed as the most powerful launch vehicle ever built, the SLS is NASA's first rocket to be specifically designed to support astronaut-crewed missions beyond low Earth orbit since the Saturn V that launched astronauts to the moon 45 years ago. And it was with that iconic booster in mind that NASA first represented the SLS with a similar black and white motif when it announced the rocket in 2011. Now, the design is exposing its more colorful core. "The program concluded the core stage of the rocket and launch vehicle stage adapter will remain orange," a NASA statement described, noting orange is "the natural color of the insulation that will cover those elements." The burnt orange-color foam is the same that was used to insulate the space shuttle's large external fuel tank. Back in 1981, NASA painted the first two of those tanks white to protect against ultraviolet radiation, but chose to forego the coating on subsequent missions to save on the weight of the paint. 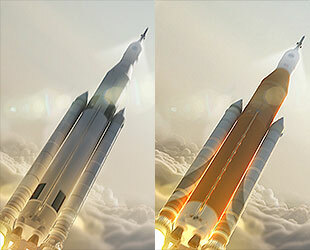 The new SLS art also includes stylized orange and gray markings on the vehicle's two side-mounted boosters. The solid rocket motors are built from the same casings that flew with the shuttle, but are now one-segment longer (for a total of five) to provide the additional thrust needed to launch the more massive SLS. The look of the rocket's exterior was just one of the details confirmed by the critical design review (CDR). The CDR examined the first of three configurations NASA plans for the rocket, referred to as "Block 1." The Block 1 will have a 77-ton (70-metric-ton) lift capability powered by the twin boosters and four RS-25 engines, the latter also reused from the space shuttle. 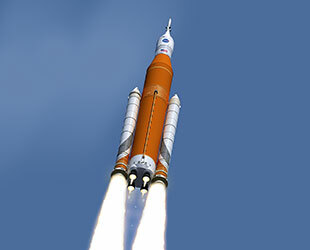 The next planned upgrade of SLS, the 1B, uses a more powerful upper stage with a 115-ton (105-metric-ton) lift capacity. 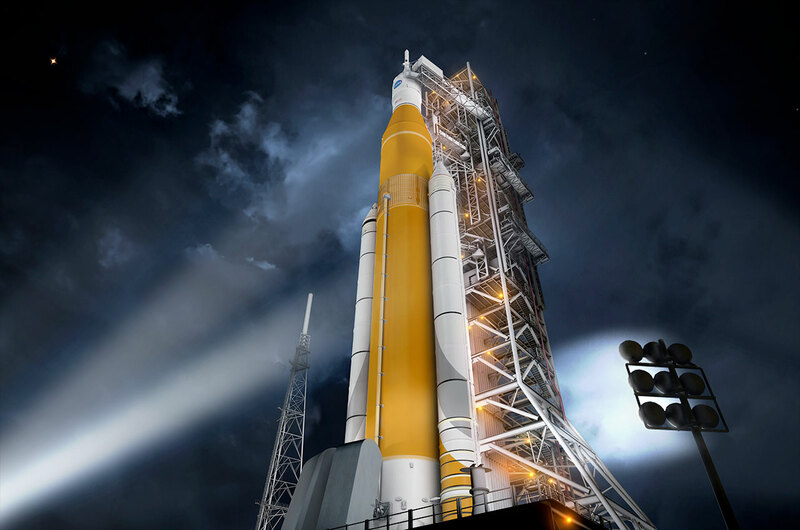 The Block 2 SLS will add a pair of advanced solid or liquid propellant boosters to offer a 143-ton (130-metric-ton) lift capacity. In each configuration, the SLS will use the same core stage and four RS-25 engines. "This review gives us confidence that we are on the right track for the first flight of SLS and using it to extend [the] permanent human presence into deep space," said Hill. Thirteen teams of engineers and aerospace experts took 11 weeks to review more than 1,000 documents and more than 150 gigabytes of data as part of the process. The CDR was the last of four reviews that examined SLS concepts. The next step is design certification, which will occur in 2017 after manufacturing, integration and testing is complete. The certification will compare the actual final product to the rocket's design. The final assessment, the flight readiness review, will take place just prior to rocket being ready to launch. "This is a major step in the design and readiness of SLS," stated John Honeycutt, SLS program manager. "Our team has worked extremely hard and we're moving forward with building this rocket. We are qualifying hardware, building structural test articles, and making real progress." A separate CDR, now underway, is reviewing the design of the Orion spacecraft, the astronaut-carrying capsule that will launch atop the SLS. 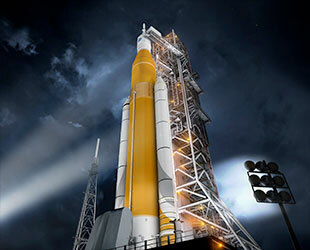 NASA has said it will be ready to launch its first crewed Orion and SLS mission by 2023.